Fraker Fire Protection Inc. is recognized as the industry leader in providing testing, repair and installation of fire suppression systems in Los Angeles County, Ventura County, Orange County and the Inland Empire. We have all the resources and skilled technicians to implement the best fire suppression system for your needs. In addition, our services meet all requirements of the National Fire Protection Association, State Fire Marshal and local fire departments. Having the right suppression system is critical for every facility and we cater to schools, businesses, industrial centers, commercial buildings and more. Fire suppression systems are multifaceted which means that there are various regulations to follow. As mentioned earlier, all Fraker Fire Protection Inc. services, from testing, installation to repairs, comply with the State Fire Marshal requirements, State of California Codes, and the National Fire Protection Association. Kitchen Suppression Systems: All kitchen suppression systems tested, repaired and installed by Fraker Fire comply with the UL 300 standard which requires an increase in the amount of wet chemical agent to be applied to cooking appliances. We also offer monthly and quarterly system and component inspection, semi-annual testing and maintenance, record keeping, and training and education for personnel as prescribed by the regulations. 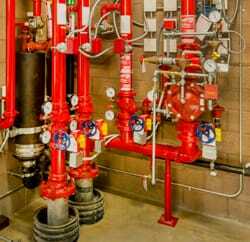 Fraker Fire Protection Inc. offers testing, repair and installation services for all types of fire suppression systems including wet and dry sprinkler systems, special hazard suppression systems, restaurant kitchen hood systems and fire extinguishers. Restaurant kitchens are at major risk for fires caused by oil and grease spills and other accidents. Fraker Fire Prtoection is here to offer testing, inspecting, repairs and installation of kitchen hood systems in order to protect all aspects of your restaurant kitchen.